If you are thinking of making a career in digital marketing, go for it! According to the government, digital marketing is growing 10 times faster than traditional marketing; Hence the opportunity for those who want to give wings to their career. You may have heard the hype that digital marketing is booming (explode instead), and businesses with an emphasis on online promotion. If it is true. Bigger budget, decent wages and growth are some of the benefits of a career in digital marketing. According to experts from India’s Digital Ad Industry will be $ 1 Billion. Are you confused if you want to enter digital marketing or go to college? It is good for you to take a look at the benefits of digital marketing before making any decision. Have you heard about digital skill gap? According to the forecast till 2020 there will be 2.5 lakh jobs in digital marketing and not professionals enough to work. The requirement for skilled and professional jobs will increase further due to the increased use of digital marketing and brands and SME advertising. Thus, you get a competitive advantage to nurture your career in a profession where demand is more than supply. Do not miss this opportunity! At the time of the recession, most employees were bogged down in uncertainty and problems. Is not it better to learn new skills that can give you job security with exponential growth? Digital marketing doors are open to beginners and experienced. If you are experienced then just give it a digital touch to your ability, that’s it. Many multinational and Indian software companies are admitted into digital marketing services. This opens doors of opportunity for students to join major IT companies like Accenture, Infosys, Cognizant, HCL, Zeta Interactive and many others. We have already discussed that the requirement of digital marketing experts is more than supply. And here is the advantage. You know that you are working in an industry where skilled workers are not readily available, it means that you are a good resource for the company and can negotiate the salary accordingly. Wages in digital marketing have increased the pace in recent years. SEO, PPC, SMO and other digital marketing profiles have noticed a decent boost in wages. A fresher can be expected between Rs 15,000 to 30,000 rupees per month. The sky is the limit for experienced professionals. One of the biggest benefits for digital marketing professionals is using your skills to generate passive income. With Google AdSense, Affiliate Marketing and Freelancing, you can able to earn a good income. Most professional bloggers and full-time digital marketers earn thousands of dollars per month. Very popular and experienced bloggers earn more than $ 10,000 + per month. Unlike other job opportunities where they need to complete their studies to work in any business, digital marketing profile doesn’t follow these conditions. Even without joining any company, you can work as a freelancer through online projects. Start blogging to draw attention to the large fans. Give online exam like Google Adwords, Google Analytics Exam for checking your skills. After completing this test, upload your certificate in social networking sites like LinkedIn, seek the attention of recruiters. Digital marketing offers flexibility. All you need most in this profile is the Internet. So no matter if you work at home, in the office or anywhere else, unless you have good network connectivity. There are a large number of companies that wish to outsource their digital marketing project. Solve their problems at any time, you can add precious dollars in your pocket. I hope you are well aware of the benefits of digital marketing. Digital marketing is a booming industry. Many companies are now migrating to the digital platform, and yes this profile will never be obsolete. The online marketing industry continues to grow in India at an astonishing rate of 40% and other industries seems slow with only 5-10% growth. Interestingly, this growth rate will continue in India even in the next few years. Currently, the digital marketing industry employs approximately 4 lacs people today, but will need 15-20 lacs trained professionals by 2020 in India. Every business will need trained professionals to create and execute strategies in online marketing campaigns to succeed and sustain. This is why the demand for trained professionals in online marketing is bound to increase each day. Excitingly, the highest growth rate is in Search Engine Marketing(SEM) jobs. This industry needs trained professionals in literally large numbers. So, if you are someone looking for it in the big online world, equip yourself with the skills of PPC platforms like AdWords, BingAds, Facebook and Twitter. So what do you think now? Shape your career with digital marketing and start your career. 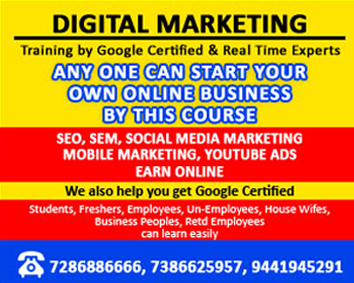 Start with a free Demo in digital marketing @ Vizag School of Digital Marketing. Click Here or Call us at 9441945291 for more information.